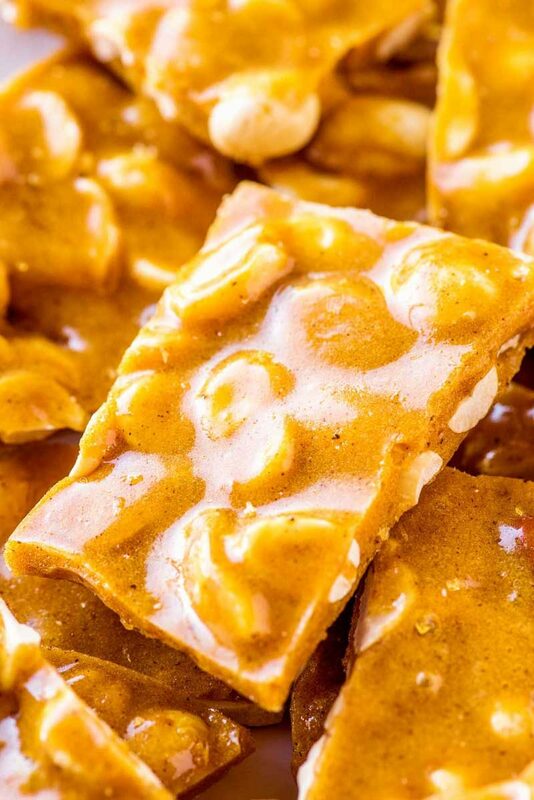 This easy peanut brittle is a no-fuss recipe made quickly in the microwave that will look like you spent all day working on it. It's a classic cold-weather treat that's perfect for snacking or gifting! 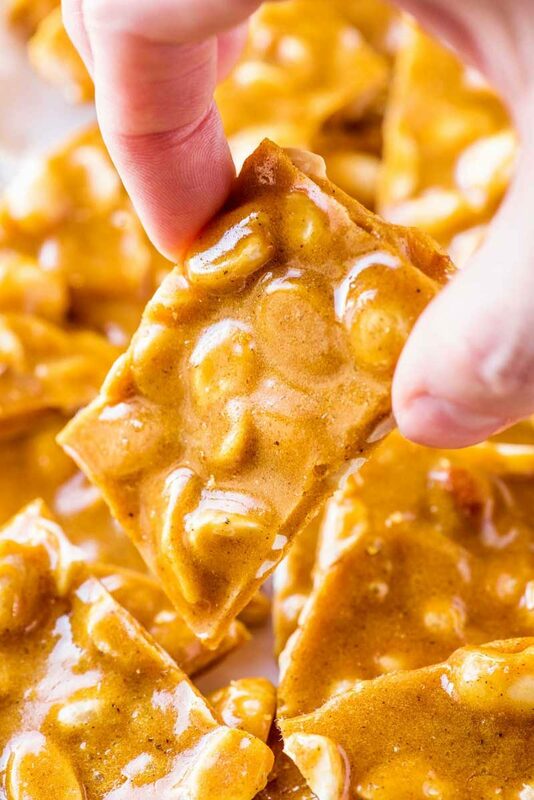 We all have those moments where we simply need an easy sugar fix, and there are few homemade candies out there that cover all the bases quite like microwave peanut brittle. Is it easy to make? Absolutely. Sweet but not too sweet? Check. Perfect for curing a crunchy food craving? Truth. This low-hassle easily become my favorite go-to candy. Especially this time of year, when I always seem to have extra peanuts on hand, this brittle is so worth the 15 minutes it takes to make. A large, microwave-safe bowl, and ideally one with a handle. Since we’re microwaving the bowl, be sure you have oven mitts or a thick towel that won’t slip so that you can handle the hot bowl. A small baking sheet, around 9×13 inch in size. One small mixing bowl, for getting dry ingredients ready. Your favorite cooking spray. Making homemade candy is a sticky affair, so anything that might touch the finished candy (the baking sheet, the rims of the bowl, even the spoon you’ll use to spread the candy out) could use a spray or two of cooking spray. I really do think this brittle is the perfect candy, because not only is it great for snacking, it also makes a great gift. And, better yet, it’s a gift you can make in advance. When homemade peanut brittle is stored properly, it can last up to two whole months. If you’re gifting the brittle, just write the date it was made and storing instructions on the packaging for your friends and family. If you’re loved ones are anything like mine, they’ll love that this is a treat they can enjoy for weeks to come. Not bad for only 15 minutes of your time! The core of peanut brittle is working with heated suger – which, let’s be honest here, can be very tricky. It takes a bit for sugar to reach the correct temp, but once it does and begins to turn color, it doesn’t take much longer for the sugar to burn (and ruin your candy). To help avoid this, prepare and measure all ingredients in advance so that you can work quickly. Also, when heating the sugar, always start at the low-end of the heat times and work your way up, always watching for the sugar to turn the correct light gold color. Sugar will continue to cook once removed from the microwave, so if you’re unsure, it’s better to remove the bowl too early rather than too late. Once you’ve mastered the sugar, the rest is simple and easy to follow in the directions, but you must work quickly. If you have a friend that can help you juggle all the bowls and baking sheets, the extra set of hands will go a long way! Even if you’ve covered everything with cooking spray, you’re bound to get some hard candy stuck to your bowls or utensils. If this happens, soak them in a mixture of hot water, dish soap, and white vinegar for one hour. The candy will either dissolve or easily break off under light pressure. Because you’re using cooking spray, the finished candy may feel a little greasy. If it does, use a paper towel to lightly dab the candy to remove excess oil before storing it. Store peanut brittle in a dry, sealed container at room temperature. If candy needs to be stacked in the container, add sheets of wax layers between the layers. This post first appeared on The Slow Roasted Italian website (where I am a monthly contributor) and has been syndicated here. In a small bowl, add nutmeg, cinnamon, and baking soda, then set aside. Spray a small baking sheet generously with cooking spray, then set aside. In a large microwave-safe bowl, add granulated sugar and light corn syrup. Use a spatula to stir until combined. Mixture will be very sticky and difficult to stir near the end; this is okay. Microwave sugar syrup mixture on HIGH for 4 minutes, then stir. Return bowl to microwave and heat for another 3 to 5 minutes or until mixture turns a light golden color. Be careful not to overheat; a dark brown hue means the sugar has burned. Spray rim of bowl with more cooking spray, then pour brittle mixture on the prepared baking sheet. 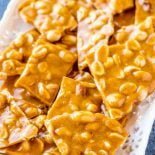 Working quickly, use a spatula or a spoon to smooth the peanut brittle out in a layer roughly the same thickness as the peanuts. Because working with heated sugar can be tricky and temperamental, it is best to make this recipe only for the listed portion. Doubling this recipe is not recommended. 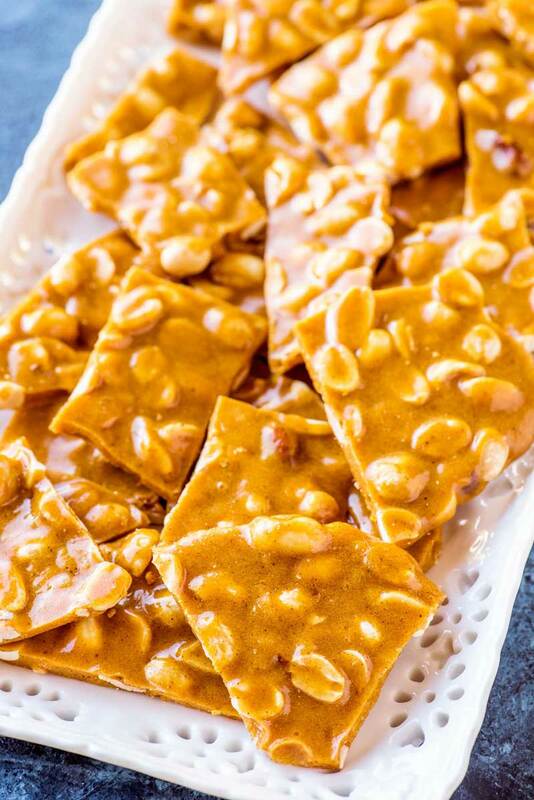 I’d never turn down a chance to make easy homemade peanut brittle! I can totally see this being a perfect sweet to make and indulge in later! Great recipe!